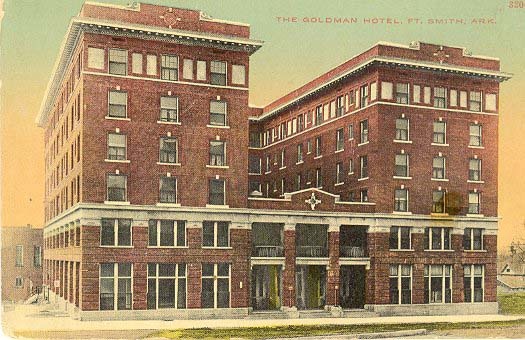 The Goldman Hotel is shown here before the third wing was added on the north side of the building. Often the Goldman is thought of as being a Garrison Avenue building because of how it, along with nearby Immaculate Conception Church, dominated the east end of the street. However, the main entrance of the hotel, seen here, fronted North 13th Street. The Goldman opened for business in 1911 and was demolished in 1994. For many years before its destruction, it had been vacant and largely abandoned. The hotel as named for Lesser Goldman, a St. Louis cotton broker and investor in the building.